A home salon is a service that offers a broad variety of services right from the latest international trends in hair, nail, skin and beauty to taking care of a customer’s grooming needs. All of this is offered fuss free by professionals who are seasoned and skilled to provide you their services, all at your doorstep. Some of these services have on board experienced and skilled stylists who are artists of their craft, that of beautifying a woman. A majority of these services features well-trained artists who also carry reference checks so that you will feel assured in letting them into your house. A home salon is essentially beautifying services at your doorstep. The basic services of a home salon are allowing the customer to pick up a service from a bouquet of services, selecting an appropriate date and time for the make-over, checking the real time availability of the artists, picking his price point, setting a convenient location to do the makeover and finally sitting back and getting glammed at your doorstep. How does it Compare to a Traditional Beauty Parlor? A beauty parlor or a beauty salon is an establishment, which gives cosmetic treatment to men and women. Other variations of this business are hair salon and spas. Beauty parlors offer more generalized services with regard to skin health, facial aesthetics, foot care, nail manicures, aromatherapy, meditation, oxygen therapy, mud baths and oil massages. Here it is to be noted that there is a vast difference between a hair salon and a beauty salon. A hair salon is a specialized shop which offers treatment just for your hair. However, a beauty salon provides holistic treatment to your face, skin, visage and other parts of the body. At times, spa treatments are also included in a beauty salon. These are very different from the home salon services that some individual skilled professionals provide. 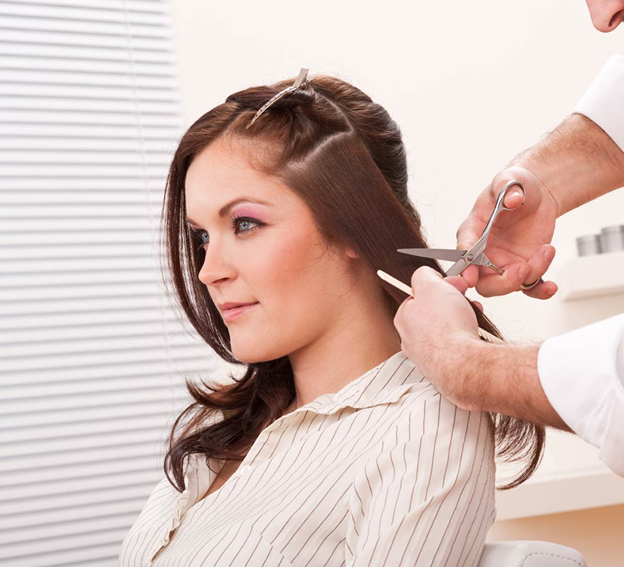 For enjoying the services of a beauty parlor, you will have to walk down to the parlor, scrutinize their catalogue, examine the services they provide and then decide which of them you would like to opt for depending on your budget. In order to provide an answer to the above question, it is necessary to know for what occasion you need the beauty treatment. This section will give you a lowdown of five conditions in which a home salon is better than a beauty salon. When you have had a lot of alcohol on your last party out of home and you are slated to attend another such party the next day, you will be suffering from the hangover of the previous party and will be nervous for the impending party. At such times, it is always better to approach an individual to give you personalized services. Whenever you are undergoing periods, it is always advisable to approach an individual professional from UrbanClap who can offer you personalized services at home.This is because you may not find yourself comfortable in the new atmosphere of the beauty parlor in the condition of your periods. In the homely atmosphere, there are more chances that you will feel comfortable with your beautification. When you need a massage badly but within your comfort zone, then you can call a friend of yours to partake of the home service along with you so that it will prove to be very economical for you. You will get a concession from the professional beautician if you bring in another customer for her. When there is an unplanned date you have to attend and you are not prepared for it, then it is better to call the beautician home and take the home salon service. This is because a beauty parlor will require you to book your time in advance whereas an individual professional will have no such hassles. When you are about to embark on a holiday and you have yet to pack your things, do shopping for the trip and you have also to try out your new clothes, then you are hard pressed for time. At such times, it is always better to go for a home salon service. Thus, in answer to the above question, it will suffice to say that whether a beauty parlor is better than a home salon service will be decided based on your occasion for which you wish to beautify yourself.